Every pizza place you'll visit strives to have the best pizza in town, but Brothers' Pizza Company has a different mission: they serve "pizza with a purpose." 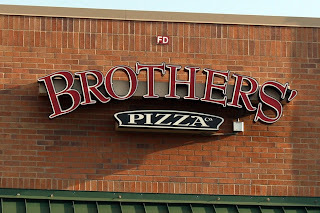 Brothers' Pizza pledges to donate 100% of their proceeds to faith-based organizations. So, how is the pizza? 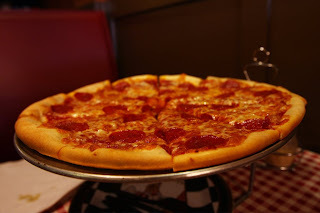 Brothers' Pizza Company serves New York-style, hand tossed pizzas using a homemade sauce and fresh cut ingredients. Each pizza is made to order and ours arrived piping hot (seriously, straight out of the oven hot) at our table. The basic tomato sauce had a good flavor: it was a rich, sweeter sauce with tasty tangy pops in places. The crust was thicker than most New York pies, but it was wonderfully dense to the edge then rolled under, creating a few little air pockets. The taste was excellent with a good crunchy bite on the bottom. They weren't overly generous on the cheese, leaving just a medium pull-away. It was a good, solid cheese that certainly beats the chains but it wasn't anything spectacular. The pepperoni fell into the same ho-hum category, predictably tasting like the pepperoni slices I've had all over town. At first, I would have given the pie an average review, noting the highlights of the sauce and crust. But with each bite I took, I found myself liking the pizza more and more. Hmmm. The restaurant itself was very clean with a friendly, helpful staff. 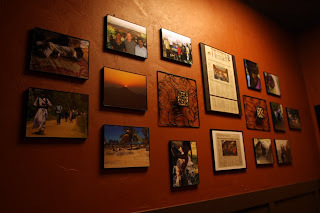 I'll definitely visit again and certainly recommend that you give it a try as well. Thanks for introducing me to a pizza place with a great business ethic! I'm never in Franklin, but if ever am for some reason, hopefully I'll remember this. PS. 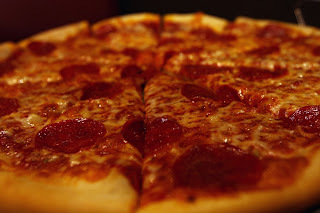 I may have already said this, but my BF & I really like Roma Pizza. 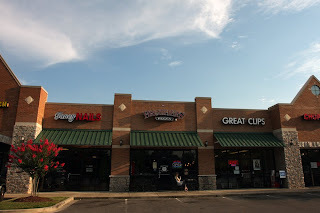 I know it's a local chain, and I've heard that some are better than others. We get ours from the Elliston one, and it's always been great.